Viren Rana, a fourth-year student at the College of Osteopathic Medicine, has achieved an unusual feat for someone still in medical school: He published his first medical paper in a major, peer-reviewed journal, and the treatment outlined in the paper appears to help to ameliorate a growing surgical problem. The research is already making waves in the ophthalmological community. “We see published papers sometimes with students who come into medical school, typically it is a microbiology article they have done as an undergrad, or something similar to that,” said Robert Stephens, professor of anatomy and neurology, who mentored Rana on the research, along with Steven Silverstein, clinical professor of ophthalmology. The paper was published in the Journal of Cataract and Refractive Surgery in September. While Rana doesn’t know if the paper was a factor, he found out last week that he indeed has been matched to the prestigious Brown University Ophthalmology Residency Program. An engaging and ebullient personality, Rana was drawn to ophthalmology because of the opportunity to work closely with patients and also be a hands-on physician. 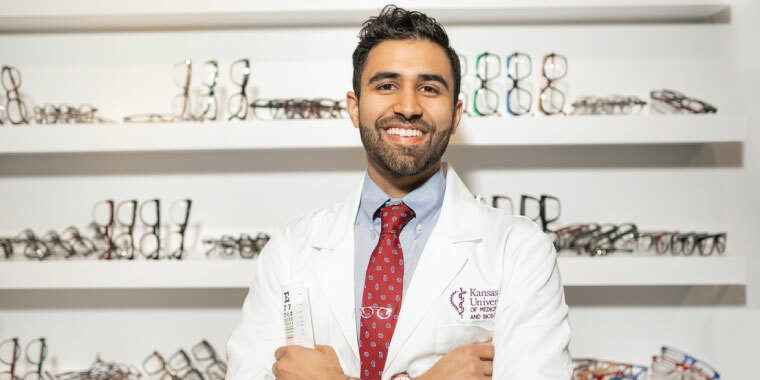 “I love working with people, and I want to be able to have a relationship with my patients, but also utilize my hands, and ophthalmology is perfect for that balance,” Rana said. Rana is currently finishing his clinical rotations at Ascension Hospital in Michigan, but while in Kansas City he participated in the Kansas City Free Eye Clinic. Rana travels to India to visit family occasionally, and has taken the opportunity to visit eye clinics while there in recent years.